Whether you are a regular or first-time diner at Zuan Yuan Chinese Restaurant, we promise you an unparalleled dining experience. Throughout the month of December, the culinary brigade spearheaded by Chef Michael Chew Chee Peng brings you a mouth-watering 12-head abalone promotion that is just as juicy as the abalone itself! To many connoisseurs, the king of molluscs is the ultimate gourmet experience and revered around the world for their unique taste and texture. Chew rolls out the abalone-laden dishes in style but kept the menu simple to ensure its flavours remain. Zuan Yuan Chinese Restaurant resonate with local taste buds and makes a great venue for family gatherings, corporate banquets and daily meals alike. This highly-prized ingredient has been re-invented under the masterful hands of Chew into five superb variations. 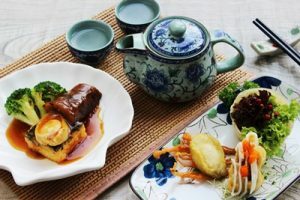 Highlights include Pan-Fried option served with Crispy Scallop Roll, Braised with Sea Cucumber and Homemade Tofu, Braised with Black Truffle and Mushroom, Braised with Sea Cucumber “Teo Chew” Style and Double Boiled Soup with Herbs. Apart from the mentioned, also vying for attention are the Chef’s Sweet and Sour Chicken with Dragon Fruit, Stir Fried Beef Sirloin, Onion and Garlic Flakes with Black Pepper Sauce, Braised Homemade Bean Curd with Lily Bulb and Dried Scallop, Crab Meat and Pine Nut in Lettuce and Grass Jelly with Aloe Vera and Lime Juice! The Abalone Supremacy promotion is priced from RM48.00nett per portion.